Can Environmental and Social Performance Be Included In Company Valuation? In January, I fought through piles of snow to get to Providence, Rhode Island, to join a group of accountants and valuation experts. The goal was to discuss how sustainability-related intangibles could be included in company valuation processes. The meeting was arranged by Joy Pettirossi-Poland of Building Bridges. She was supported by XPX Boston and RISCPA and R. Paul Hermann was also there to share insights from the great work he does at HIP Investor. Although I’m a CFA and I’ve done a fair amount of company valuation work, I didn’t feel qualified to jump into the meeting’s core discussion. (I believe Joy intends to expand her program and that she will host further meetings on the same subject in other venues in the Northeast. Contact her or me if you want to know more about these plans.) My assigned task was to give the participants a sense for how much sustainability data might be available for companies in the area—specifically those in Rhode Island, Connecticut and Massachusetts. After all, if few or no companies are collecting data on their sustainability performance, it would be impossible to bring these factors into a valuation study. 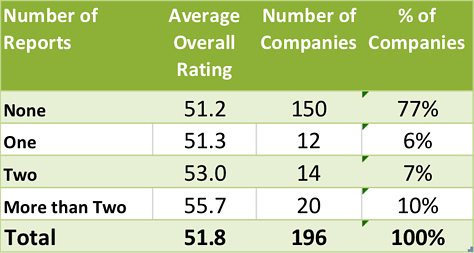 I found that our CSRHub database has ratings for 287 companies in these three states. While this is a small fraction of all companies in the region (there are at least 300,000 companies in Connecticut, alone), it is a high percentage of larger, listed companies. For instance, there are 131 publicly-traded companies in Connecticut and we have ratings on 77 of them, or about 60%. 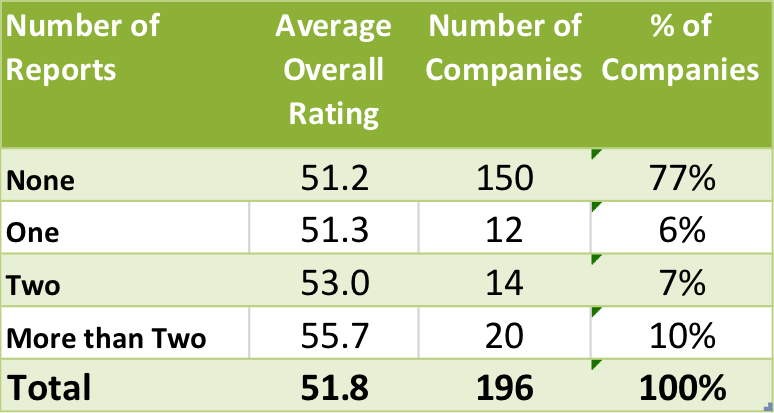 We had enough rated companies for all three states to show that the average perceived sustainability performance of companies in the three states was pretty similar. The data we had on these companies came from ESG (environmental, social and governance) raters (we aggregate data from eight of these investor-serving firms), non-governmental organizations (NGOS), and various media and crowd sources. We use data from 308 different resources in our ratings. However, I feel that there are four voluntary forms of reporting that are good indicators of whether or not a company is producing information for its own internal use. They are CDP (formerly known as Carbon Disclosure Program), GRI (Global Reporting Initiative), UNGC (UN Global Compact), and the presence or absence of a corporate social responsibility (CSR) area on a company’s web site.  (Every company we studied had a corporate web site.) This table shows that only relatively few of the companies in the region did any of these reports—with the highest percentage of self-reporting coming via a company web area (73 out of 287 companies, or 25%). Unfortunately, if only 25% of big companies are gathering sustainability information, the percentage of all companies in the region who are both gathering and publicly reporting CSR data is likely to be miniscule. The only thing we could offer to offset this bad news was evidence that more disclosure does seem tied to a better perception of a company’s social performance. As you can see, companies that do two or three reports from the CDP/GRI/UNGC area get much better CSRHub sustainability scores than those who do no or only one report. An analogous pattern is present for those who have a CSR web area versus those who do not. This result is consistent with other studies we’ve done across the full list of 8,900 companies that we rate. Companies who create sustainability-related information about themselves are perceived to have better social performance. Our audience of valuation and accounting experts seemed to appreciate that this better social performance could create a boost to the value of a company. They also seemed to agree that they would use data that fits into a standard structure and schema, if they wanted to include sustainability factors in their valuation work. An article in the March 2014 edition of The CPA Journal by one of the other speakers, at the event, Providence College professor, Michael Kraten, reviewed and summarized our discussion. If they had the data, I think the accounting and valuation profession would start to include sustainability factors in their valuation work. If they did, it could encourage more companies to gather and report information on their social performance.